During the Age of Reformation, religious contentions split Christendom, creating wars between Protestants and Catholics in Europe. However, “the exchange of intellectual and artistic ideas continued to thrive” (Gardner 625). There was trade between Italy, mainly Catholic, and the Holy Roman Empire, mainly Protestant. Art benefited from this exchange because the ideals of humanism spread from Italy throughout all of Northern Europe (625). These Northern humanists learned about the cultures and literature of classical antiquity, yet they focused “more on reconciling humanism with Christianity” (625), thus gaining the name “Christian humanists.” Therefore, many artists developed a distinct Northern tradition. Artists showed biblical experiences occurring in Flemish homes because “religion was such an integral part of Flemish life that separating the sacred from the secular became virtually impossible” (Gardner 522). Northern European artists loved disguised symbolism. Merode Altarpiece by Robert Campin shows the Annunciation occurring in an every day home. The triptych’s side panels depict roses, symbolic of Mary’s immaculate conception, and rodent traps, referring to the black plague that wiped out half of Europe’s population in addition to St. Augustine’s writings about Christ setting the trap for Satan. By placing this sacred scene in these common surroundings, it made the religious world accessible. Campin trained the new generation of artists, including Jan van Eyck, who painted Giovanni Arnolfini and His Bride. The portrait shows shoes taken off, suggesting holy ground, and along the mirror depicts scenes from the passion of Christ. This is “a purely secular portrait, but one with religious overtones” (524). Money-Changer and His Wife by Quentin Massys reflects a connection to the Renaissance interest in combining sacred and secular. The oil on wood depicts a “secular financial transaction” and “a commentary on 16th century Netherlandish values” (639). At this time, “trade and shipbuilding was one of the most profitable businesses” (637). The man sifts through the coins, focusing on one in particular, while the woman looks on. Is she neglecting her prayer book and focusing on worldly possessions, made possible from recent wealth? By joining the secular and the sacred, as this artwork can become a cautionary or celebratory tale. Therefore, the artwork depicts either a materialistic man and woman or a metaphorical representation of the last judgment. If the second be true, then the man is symbolic of Christ, and the wife is symbolic of Mary as intercessor. Albrecht Dürer is known as the Michelangelo of the North and is a Christian humanist. His Self-Portrait bears an undoubtedly strong resemblance to Christ, almost sacrilegiously. The gentle, cascading fall of curly ringlets rests against the thick fur. His fine, thin skin is smoothed into a serious expression. 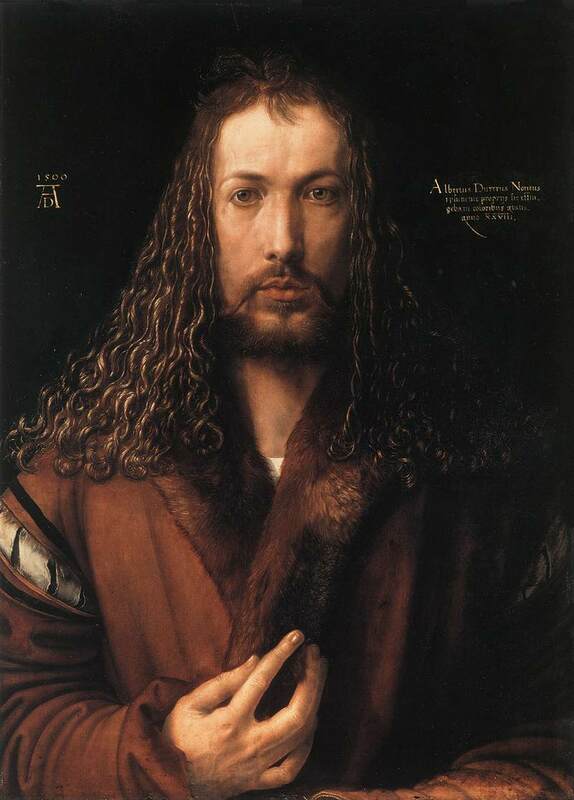 Dürer saw himself as the Savior of the German art world; he was going to help German artists come out of the provincial, unschooled technique and to teach them the latest techniques. There was the idea that Italians were corrupt and decadent, while purity was in the North where piety reigned. This self portrait of Dürer’s is “reminiscent of medieval icons” (Gardner 628), such as Christ as Savior of Souls from the church of Saint Clement in Macedonia. 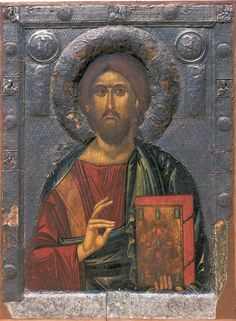 Dürer’s right hand is similar to the gesture of blessing by Byzantine icons but not quite—that would be blasphemous (628). Focusing on the hands could suggest creativity; therefore, the idea of “the artist as a divinely inspired genius,” a humanist view, had impacted the German artist in the North. Ultimately, he became known as “the first Northern European artist to understand fully the basic aims of the Renaissance in Italy” (628). During this religious turmoil, Dürer converted to Lutheranism. Four Apostles shows his support. The four apostles include John and Peter on the left panel with Mark and Paul on the right. Each apostle has “individual personalities and portraitlike features” (630), referring to the humanist ideal of focusing on the individual and his or her potential. In this painting, Dürer has John the Evangelist in prominence because Peter, who was considered representative of the pope, stands behind. The New Testament writings of John connected with Luther because of his focus on Christ. Additionally, Dürer chooses to depict both John and Peter reading the Bible together; Martin Luther believed the Bible was “the single authoritative source of religious truth” (630). Luther writes in An Open Letter, “[T]hey cannot produce a letter in defense of it, that the interpretation of Scripture . . . belongs to the pope alone” (51). These radical arguments were made possible by the humanists of the Renaissance, who encouraged people to think, learn, and question. Thank you for reading & commenting. I’m so glad that you found it interesting. 🙂 If you would be interested in reading my most recent post, please follow this link (https://thebippityboppitybeautifulblog.wordpress.com/2015/07/13/the-age-of-realism-art-history/). Gardner is the ultimate Art History Book! Thank you for reading & commenting. Gardner really is super great. 🙂 If you would be interested in reading my most recent post, please follow this link (https://thebippityboppitybeautifulblog.wordpress.com/2015/07/13/the-age-of-realism-art-history/). I have read the post, Keep up the informative art history writing!! !